Tusk Ratchet Spark Plug Wrench 13/16"
Made for most two-stroke water cooled motorcycles and ATVs. Ratchet design for easy installation and removal of spark plugs. Thank you Tusk for another great tool! I’ve been needing to get a spark plug wrench for years. This ratchet mechanism is the the way to go! If you own any liquid cooled 85-89 ATC/TRX 250R and Yamaha Banshee models then look no further! Its a spark plug wrench... not much to say about it. Very slim and easy to keep in pack. Little heavy but what do you expect unless paying for a titanium wrench but... who does that anyway? Buy one, buy two and gift it to your two stroke buddy. These work great and are easy to stash. RMATV/MC shipping is super fast. Maybe for an 80s bike. Could not get them to clear into the tight space of a 2015 KTM 85 or a TC 85. If anybody wants mine, you can have it. I have no use for it. A toolbox Tool, not the best for the fanny-pack. Ratcheting Spark plug wrench isn't needed. You torque it loose and twist the plug by hand. I never used the ratchet feature of this wrench. Possible useful if you're working on neglected motors or cross threaded plugs. For the Enduro rider: this is heavier & thicker, I'm now carrying the simple Tusk plug wrench in my Fanny pack. This wrench is a toolbox tool now. Absolutely love this plug wrentch I have one in every pack. I love this sparke plug wrench! All my buddys want one! I ride a husky 300 two stroke, and this tool makes it simple to change out a plug woth ease. I keep this tool in my gear bag, and I'm probably going to buy another to keep in my tool box. Highly recommend! I bought this because my riding buddy got tired of digging his out of his pack for me. I have an oversized tank, and this gets in there to change the plug so easy. Price is great!! Great product and makes it easy to remove the spark plug out of my 94 KX500, 2003 CR250R and CR500RAF! Very useful and work flawlessly. Very useful and work flawlessly. This is a great little tool for a 2 stroke rider. Smooth operation. Light weight and easy to take along in a pack or even a pocket. This wrench is the best way to tighten a spark plug on a 2 stroke. 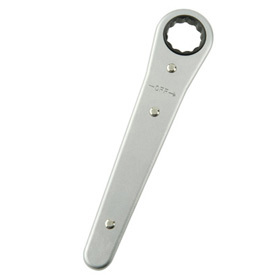 The tank and radiator do not get in the way when using this wrench like an adjustable wrench. Light, well-constructed, and dedicated tool for my YZ125 spark plug. Fits easily into my trail pack. Iv used this tool several times . Always use it to pull plug . Would recommend it . Use this for my trail bag , The small profile allows easy access to the plug. I bought this on sale and I have used it many times. The ratchet feature is much better than a regular wrench, considering the price that I paid for it, it was a no-brainer. Perfect to keep in your "track" box for that quick change when a plug fouls. I have used this wrench on the side of a trail many times, changing out spark plugs without removing the tank. Saves a lot of time and fits great in a tool bag due to its thin profile. Worth every penny. Simple tool, seems well built. I say it works great! Nice compact plug wrench. It's pretty flat so doesn't take up much room. Easy to get into tight areas. Works great. Tusk always impresses. Perfect for my kids 2-smoker. He keeps it in his camelback for those "fouled plugs in the middle of nowhere" occurrences. Works perfect, ratchet helps a lot. Bring it with me all of the time when I ride along with a plug. This tool makes removing the plug easy, quality of tool is good. Who doesn't love the right tool for the job? Good tool. durable, gets the job done in tight spots. Got this spark plug wrench to carry on my KX100 for quick plug changes when I fouled my spark plug. It works great. Small size fits easily in my number plate bag with my spare plugs. Ratchet makes the change go a lot faster. Just flip it over to turn in the opposite direction. Very easy to use. This is a great tool for changing my plug on my CR500 that has a desert tank on it and the plug is harder than normal to get to. Quality is great and its not to heavy to pack with you. This thing is much more convenient than a wrench. Fits right in my back with my other tools does not take up a lot of space and is very handy. Will it be the right size for my 2003 honda cr125r? BEST ANSWER: iif your spark plug is 13/16" then yes. Is 13/16" the correct size wrench for a 2006 Yamaha 450 4x4 spark plug? BEST ANSWER: If you could give us a little more information on the exact model of machine you have we would be more than happy to help.